Adding beauty and value to your property should not be an expensive endeavor or involve extensive property renovation. Sometimes, you just have to improve the existing amenities or add a few more key elements such as hardscape features. Hardscapes can make landscaped areas more functional, safer and more attractive. Some examples of such features are retaining walls, walkways, pathways, patios, decks, arbors, fire pits, and garden steps. But before you proceed with the installation, you must ensure that these features are carefully planned and handled by skilled people. This is something that our experts from Rainbow Acres Landscaping do exceptionally well. We create hardscapes from wood, concrete, stone as well as interlocking blocks and pavers for many years. We are one of the most trusted hardscaping companies in the state of Vermont. We service Addison, Bristol, Vergennes, Middlebury, Burlington, Brandon, South Burlington, Jericho, Essex Junction, and Montpelier, VT.
Our company believes that hardscaping design should be about combining elements harmoniously to create a breathtaking, healthy, and comfortable environment. We carefully plan, design, and work around the area in order to achieve a look that's both comfortable and functional for the users. Using our creativity and modern design tools, we strive to make the outdoors an extension of your indoor living space. We are experts in the area of hardscaping and can tell what design would fit the layout of the land. If you don't have any idea what hardscape to add, we can offer suggestions and hardscaping ideas such as sitting areas; stone retaining walls; concrete, brick, tile, or flagstone patios; stone walkways; gravel paths; stone steps; wrought iron fences; arbors; and gazebos. We can help you make choices by explaining the advantages and disadvantages of each one, as well as how much it would cost. Hardscaping is a home improvement project that naturally comes with a price tag. Hardscaping costs vary, depending on the size and complexity of the project involved. Our team of experts will do an ocular inspection of the property and determine the amount of material and time needed for the prep work. We will also inform you about the number of needed features to create an eye-catching design. The industry average is at $617 for properties under 500 sq. ft. and $2,254 for yards measuring 4,000-5,000 sq. ft. But the price can swing greatly, depending on the types of materials used. Through the years, we have been offering our clients the most competitive rates for the services we render. Please call us so we can provide you a free cost estimate. As one of the best hardscaping companies in Vermont, there are countless home owners, commercial property owners, and real estate developers who have come to us to avail our hardscaping services. Besides creating flowing and harmonious designs for homes and properties, we also offer a wide range of landscaping services, which include lawn mowing, lawn care, gardening, tree and shrub planting, driveway repairs and sealing. 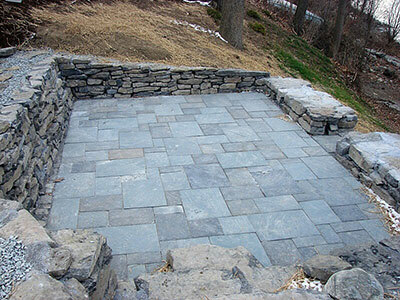 We also build ponds and water features and do natural stone work for walls, patios, and outdoor living areas. If you're interested in concrete pavers, retaining walls, and other outdoor features, we humbly recommend our team of hardscaping experts for the job. You can call Rainbow Acres Landscaping for your inquiries or ask for a quote for any of the services listed above.